Amazon announced a slew of new devices at the end of the month in September, but it looks like the company saved the best for last. That’s right boys and girls, Amazon just announced a huge update to its most popular media streaming device of all time. The new Fire TV Stick 4K offers the compact form factor you love from the $40 Fire TV Stick, but it adds the 4K resolution, Dolby Vision, and HDR 10+ support you used to only get from the $70 Fire TV. And here’s the best part: It’s only $49.99! Wait… there’s actually another best part. A co-best part, if you will. 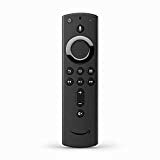 The Fire TV Stick 4K comes with the All-new Alexa Voice Remote that includes all the features from the previous-generation model, plus new programmable buttons so you can control your TV and sound bar! 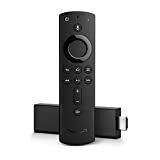 It’s included for free with the Fire TV Stick 4K, or you can order one separately for use with your current Fire TV device for $29.99. Both the new Fire TV Stick 4K and the All-new Alexa Voice Remote are available for preorder right now, and they start shipping on October 31. Fire TV Stick 4K is the first streaming media stick available with Dolby Vision and Dolby Atmos. Finding 4K content has never been easier on Fire TV—just say “Alexa, find 4K TV shows” or “Alexa, watch Tom Clancy’s Jack Ryan.” With agrowing catalog of Dolby Atmos content, customers can also enjoy 3D surround sound when connected to compatible home audio systems. Fire TV Stick 4K gives you access to live TV whether it’s through streaming apps like Hulu and PlayStation Vue or through Prime Video Channels. You can also pair Fire TV Stick 4K with Fire TV Recast and a HDTV antenna to easily watch, record, and replay free over-the-air TV programming. Now with dedicated power, volume and mute buttons that let you control your TV, sound bar, and A/V receiver.